Whilst I always recommend that Pilates is best done under the instruction of a qualified teacher, you may wish to do some extra practice at home or away, Here are a couple of online subscription services (others available), which offer a range of classes you can do on demand. Both have free trials, so you can see whether you like them before you have to pay. Developed by Body Control Pilates (my teaching association) in 2018. New videos issued monthly. Discount for those attending my classes! US based and has been running for some time. Wide range of videos and audio only option available. I started Pilates in 1999 and have been doing it ever since. Joe was still teaching when he died at the age of 83. I don’t know whether I’ll still be teaching at that age, or even reach it, but I hope to still be doing Pilates for many years to come. Winnie Harlow is an international model from Canada who suffers from vitiligo, a skin pigment disease. She has teamed up with Burt’s Bees for their campaign #BringBackTheBees. In an interview last year she says “…keep pushing for it, no matter what it is or what people think about it. 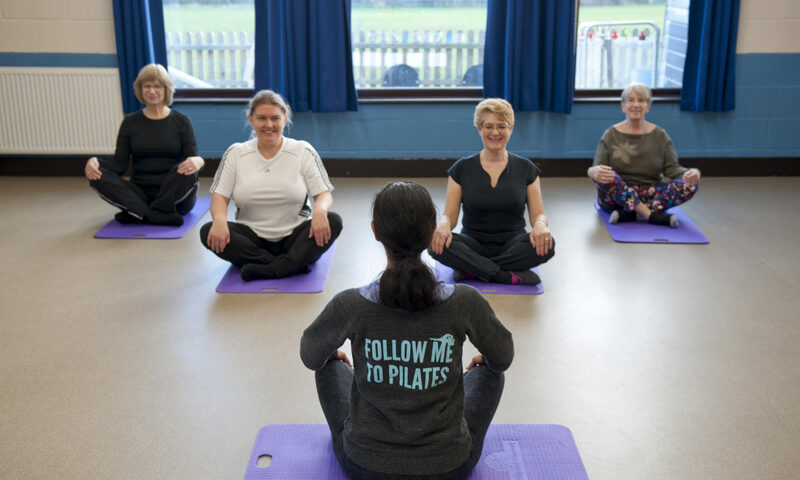 If it’s your dream, never settle.” On fitness she says “Pilates is a lot of fun too” – I couldn’t agree more! Read the full article in Vogue. Scoliosis is a condition where the spine curves sideways, in a ‘C’ or an ‘S’ shape, and the spine can twist at the same time. Symptoms vary significantly from person to person, so treatment depends entirely on the individual. The British Chiropractic Association recommends avoid being stationary at a desk for more than forty minutes at a time, and to ensure good posture while working. Pilates exercises can benefit those with scoliosis and are best done under the supervision of a certified teacher with relevant knowledge. Read this article from Spectator Health. For these exercises, focus on creating as much symmetry in your body as you can. Do up to 8 repetitions of each, identify your weaker side and do an extra 8 on that side. 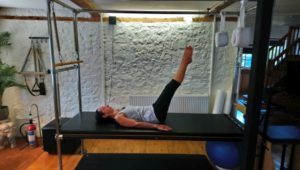 Pierce Brosnan, recently revealed that he has taken up Pilates to keep fit and has invested in a reformer/trapeze combo. See https://twitter.com/piercebrosnan?lang=en. 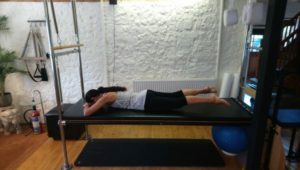 The large Pilates equipment has springs to provide either assistance or resistance helping to make the exercises more effective more quickly. If you’d like to try a workout, I have a reformer, trapeze table (cadillac), ladder barrel and wunda chair in my studio. Contact me for an appointment. Body Control Pilates is unique in having an Ofqual-ratified ‘Level 4 Pilates’ qualification. This demonstrates that a teacher has advanced knowledge and the skills to assess and develop specific programmes for a broad range of clients, including those from special populations. I am delighted to announce that I achieved my Level 4 certificate in August 2018. To gain this award, I had to demonstrate competence in repetoire beyond intermediate level, study special populations (older adult and bone health), movement, adaptations and produce a detailed case study for a client including an initial assessment, goal setting, an 8-week lesson plan and review. It has been a challenging course which has encouraged me to think differently about the combination of joint and movement strategies in the exercises that I teach; not just which joints we are moving and which we are holding still, but in more detail about the muscle groups in use and the forces of gravity as we perform the same movements in different positions. The movements at the hip joint can be seen in this diagram. They are listed below along with the muscles responsible for each action and a sample exercise. We can also combine movements such as lateral rotation with flexion and abduction. Note that the trunk and other joints maintain their position in all of the above exercises. Since the structure of our joints and length of our ligaments limit our movement, a ‘full’ leg lift needs us to move other joints as well. In the exercise below there is lateral rotation with flexion and abduction of both legs. 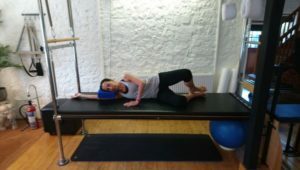 Although a good exercise for dancers, we do not usually do this one in Pilates. This is because we are aiming to use the movement of one joint to challenge the stability of other joints. 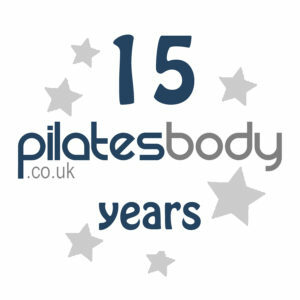 3rd July 2018 was the 15th anniversary since I qualified to teach Pilates matwork with Body Control Pilates in London..
We celebrated with a small equipment circuit at all mat classes and fairy cakes all round afterwards. I made elderflower and lemon (inspired by the recent royal wedding) and Philip kindly supplied gluten free chocolate. However fit you already are, Pilates has benefits. I recently saw photos of World Champion boxer, Anthony Joshua, doing spine curls and neck release on an overall at a boxing academy on their Instagram feed – but these photos have since been removed.